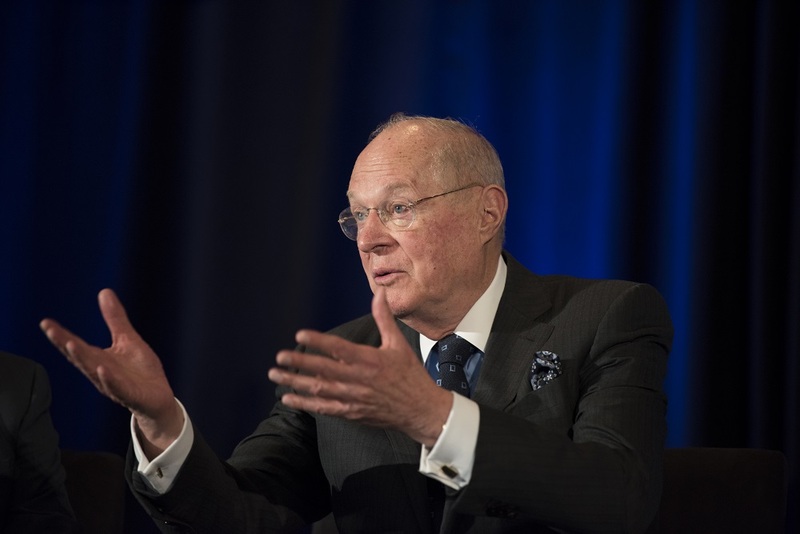 ANAHEIM, Calif. (CN) – In a short but forceful speech on the last day of the Ninth Circuit judicial conference, U.S. Supreme Court Justice Anthony Kennedy gave an impassioned defense of the rule of law and said America must continue to work closely with Europe to preserve the western legal system. In a tacit rebuke to the rhetoric of President Donald Trump, Kennedy said Europe remains a key ally in upholding a legalistic, rule-based approach to governing. Kennedy did not mention Trump by name or wade into the political battles of the day. But it was striking to see him vociferously defend the rule of law at a time when the president of the United States casts doubt on the independent functioning of the Department of Justice and tweets frequent outbursts against the judiciary when cases don’t go his administration’s way. The senior associate justice, who’s set to retire July 31, recalled meeting an ambassador at a judicial conference in Europe who described the difficulty in watching his country descend into an antidemocratic morass. Kennedy’s recent decision to take senior status on the Supreme Court and no longer sit on the bench and decide cases means he’s at the end of a tenure marked by several high-profile decisions and decades serving as a critical swing vote on the nation’s highest court. Loathe to talk about his legacy or identify some of the more watershed decisions he had a hand in making, Kennedy instead took a more reflective tone in his speech to a ballroom full of judges. He recalled his childhood in Sacramento, where his station as the son of a solo practitioner in the law meant he had been to 10 trials before he’d even been to high school. He worked in the oil fields for his uncle, served in the U.S. Army and then took up the mantle of his father’s law practice after his father was weakened by illness. “The law is the story of our moral life,” Kennedy said as he discussed his early days as a practicing lawyer. He recalled the story of a man who had built a successful business and was planning to leave it all to one son, in hopes the son would duly take care of his other two children – a son and a daughter. Along with Kennedy’s defense of the law, his love of literature was a formative influence on him as both a man, a lawyer and ultimately a judge. He recalled reading “One Day in the Life of Ivan Denisovich,” a novel set in the Soviet labor camps of the 1950s by Russian author Alexander Solzhenitsyn. He said reading about one ordinary prisoner’s experience during those times informed his approach to prison reform. Such was his love of Solzhenitsyn, that the justice recalled hungrily searching for a transcript of a speech the great author gave at Harvard in 1978. In it, Solzhenitsyn – who was booed – attacked the western attachment to the rule of law, saying anybody who interprets existence in legalistic terms is doomed to moral mediocrity. Kennedy said he was initially disappointed that an author he held in such high regard would condemn an institution he viewed as noble and essential.